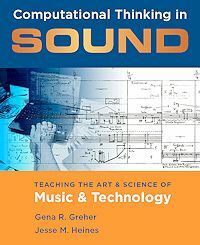 Computational Thinking in Sound provides music fundamentals educators with a one-of-its-kind text devoted specifically to music, sound, and technology. Using a student-centered approach that emphasizes project-based experiences, the book discusses multiple strategies to explore, create, and solve problems with music and technology in equal parts. It also provides examples of hands-on activities that encourage students, alone and in groups, to explore the basic principles that underlie today’s music technology and freely available multimedia creation tools. What is the most important issue in music education today? Gena R. Greher is a Professor of Music Education at UMass Lowell, where she is the 2014-2015 Nancy Donahue Endowed Professor of the Arts. Her research focuses on creativity and listening skill development in children and examining the influence of integrating multimedia technology in urban music classrooms, as well as in the music teacher education curriculum and School-University partnerships. Recent projects include: a music technology mentor/partnership with UMass Lowell music education students and two local K-8 schools; SoundScape, a technology-infused music intervention program for teenagers with autism spectrum disorders; and Performamatics, a National Science Foundation-supported project linking computer science to the arts. Before entering the education profession and crossing paths with Jesse, Gena was a music director in advertising, working for several multinational advertising agencies producing the jingles and underscores for hundreds of commercials. Gena may be reached at Gena_Greher@uml.edu. Jesse M. Heines is a Professor of Computer Science at UMass Lowell with a strong interest in music and its power to interest students in computing. He teaches courses on graphical user interfaces, web programming, and object-oriented programming with C++, and has taught the Sound Thinking course with music professors S. Alex Ruthmann (now at NYU) and Daniel A. Walzer as well as with Gena. He was the Principal Investigator (PI) on the National Science Foundation (NSF) CPATH award that funded our original development of Sound Thinking, and he is currently the PI on the NSF TUES Performamatics award. To keep music alive in his own life, Jesse sings with the Lowell Gentlemen Songsters chapter of the Barbershop Harmony Society and Fireside, a registered barbershop quartet of the Society. Much more information is available on Jesse’s website at https://teaching.cs.uml.edu. Jesse may be reached at Jesse_Heines@uml.edu.